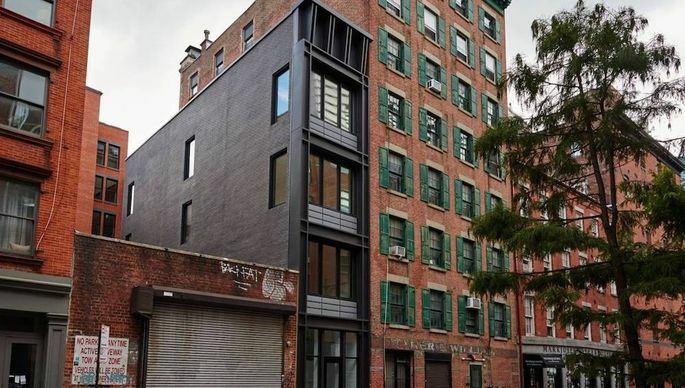 On a cobblestoned lower Manhattan street near the approach to the Brooklyn Bridge, a four-story house is about to go on the market for $5 million. The widest room measures 10 feet. For most Manhattan residents, the living has always been small. Now the market has cooled, a new wave of construction using scraps of leftover space is taking cramped living to the extreme. Homes are being wedged into spots that once might have served as a few parking spaces. Or storage. In East Midtown, architect Gene Kaufman is dreaming of a house on a lot 10 feet wide, one of the narrowest lots in Manhattan, as a test of living on a small scale. The widest rooms would be about 8 ½ feet wide—though the house would come with a small elevator. He bought the site with a six-story steel frame already in place and plans to resume construction next spring, and move in with his wife, Terry Eder, a lawyer and concert pianist. “It would be interesting to see in how small a space somebody can live in,” he said. “Architects always want to explore ideas, but we can’t always do them for our clients. City tax records list a yellow brick building on Elm Avenue in Brooklyn as a 7-foot-wide house. There are about 600 tiny houses on narrow lots of 12 ½ feet or less, according to city tax records, most built before 1930. Since 1970, only nine such houses were built in the city, according to tax records, except on Staten Island, where there has been a building boom of narrow attached houses in suburban neighborhoods. In the new crop of small Manhattan houses, developers looked to find uses for narrow but valuable strips of land left over from boom-era projects. In the lower Manhattan project, Mr. Giacoumis paid $1.95 million in 2013, for a slender, irregularly shaped through-block lot that extended from Front Street to Water Street in the South Street Seaport District. He built a 20-foot-wide red-brick condominium at 246 Front Street. Behind that he built the new house at 267 ½ Water Street. It has a glass facade with steel columns, and zinc panels. The house measures 2,706 square feet, arranged over four slender stories and has three bedrooms, 3 ½ bathrooms, and outdoor space on the roof and at the rear—but no elevator. On East 52nd Street, Sam Chang, a hotel developer purchased two buildings on the street in 2006 to put up the Hilton hotel. But a narrow 10-foot-wide piece was left over that could only be used for residential use. Originally the plan was to create a six-story residential building, with eight bedrooms, suitable for use as corporate housing. When that didn’t attract interest from buyers, work on the house at 210 East 52nd St. stopped, Mr. Kaufman said. Now Mr. Kaufman is set to resume it. “Sam’s thought was to get his money back out; my thought was to make it a residence,” Mr. Kaufman said. The plan is for a glass curtain wall out front, and stainless steel metal panels on the side walls. Mr. Kaufman said that in an era of concern about climate change, “the notion that we can have big cars, big homes, and lot of other things has changed. “Small is beautiful,” he said. That notion might suit Pierre Gentine, a professor in the department of Earth and Environmental Engineering at Columbia University’s engineering school who studies climate change. In 2012, Mr. Gentine and his wife, Marie, paid $710,000 for a new three- story house on West 132nd Street in Central Harlem. It is 12 feet wide.